Earlier this week, Avinash Kaushik pointed me towards this great video by DK. What's special about it, is how they, in an absolutely ingenious way, tell a story. While I think the video itself is brilliantly made I don't agree with the words. Some of them makes a lot of sense, but they polarize something that isn't polarized. Let me explain. The way many see the world is like this. 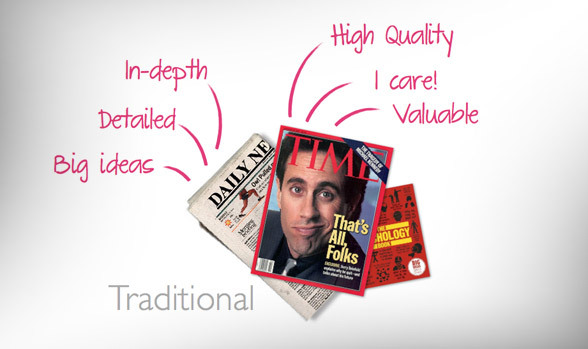 We have the old world of print, where people sit down and consume content for a longer period of time. 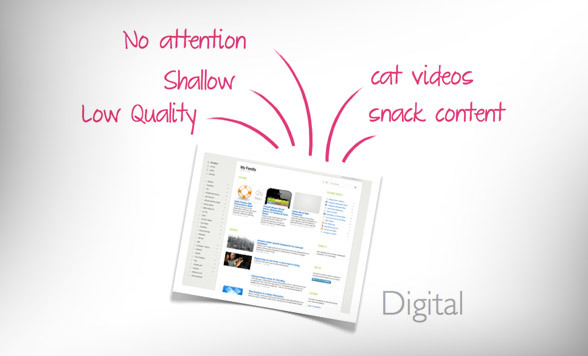 We care about it, it often covers big ideas, and it's in-depth and of high quality. Then we have the digital world, where people have a short attention span, they don't really care about you, and the content is much shallower. What people from old media fears is that, as the old world dies, the thoughtful old world is replaced by a new world full of crap. And it's true. The number of cat videos in print magazines is exactly zero. So are the number of short term internet memes or crappy social trends designed to have no purpose other than to be weird. Print is professional by default, because the limitation of print limited it to only the big publishers. But the connected world isn't just shallow and full of crap. It's also full of really high quality and in-depth content. It's both. It's everything! I understand why old media people think the internet is just crap, because they are used to a world where crap weren't allowed. But the internet has opened up this world for everyone. On one hand, you get crappy cat videos and internet memes. But on the other hand, you get some of greatest content you have ever seen - far exceeding the quality and richness of print. But the traditionalists will then point to studies showing that people spend a long time reading a print magazine versus only minutes (sometimes seconds) reading online news. And yes, that too is true ...but only if you look at each individual session. Overall, people spend 750% more time on digital channels than they do on print, but each visit might only last a few minutes. The reason is that our behavior has changed. In the past, you would get up in the morning and spend 10-15 minutes reading the morning paper, while eating breakfast. Then you would go to work, during which you would not consume any media at all. After work, you would again sit down in your living room and maybe spend an hour or more just reading the latest magazine. The limitation of distribution forced us into 'consumption periods' and naturally that caused longer sessions. But today, in the connected world, you consume content wherever you are. While eating breakfast, while going to work, while at work, while shopping for groceries, while being with friends, while watching TV, and while lying in bed. The result is that, yes, each session is a lot shorter, but overall we consume far more content than ever before, from thousands of different sources. Does that makes the modern person more shallow? Not really. It's true that content has to change. 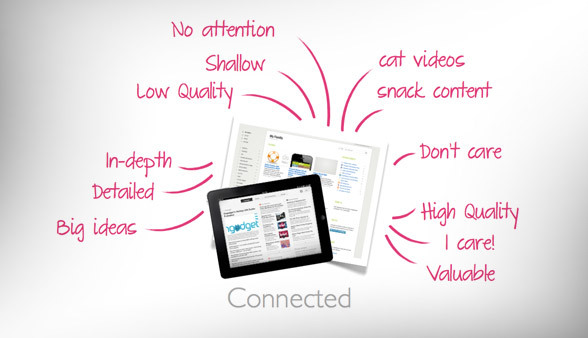 Instead of one big package, modern content has to be cut into smaller chunks of value, published as a stream. But the point is that we no longer have to wait until after work to read an article. We no longer have consumption periods. It's certainly true that the new era of media isn't as pure as in the old days. There is an increasing quantity of crap being published each day. But the connected world isn't the opposite of print. It's everything we used to have mixed with everything else. The trick is to follow the right people, the right sources, and the right content. 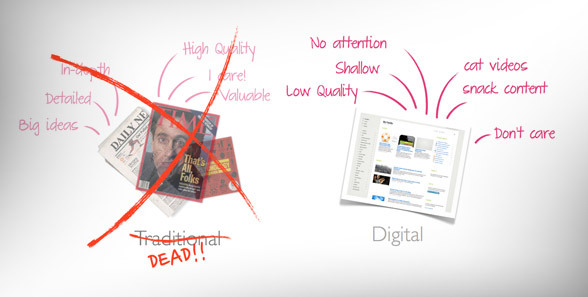 And for publishers, the trick is to stop defining your market by the limitations of the past.